The Dell UltraSharp U3011 offers everything professional designers of all kinds might need for their color-critical and multi-tasking work. The most useful features include extra vertical space due to the 16:10 aspect ratio, factory calibrated sRGB and Adobe RGB color spaces, extensive connectivity, and a plenty of image configuration options. All of that packed in a beauteous and ergonomic design. The Dell U3011 delivers stunning image quality with accurate and consistent colors due to the 10-bit IPS panel. It is an ideal monitor for the high-end professional designers, photographers, and alike as it is factory calibrated for both sRGB and Adobe RGB color spaces. Additionally, multitasking becomes much more manageable with the extra vertical space of the 16:10 aspect ratio instead of the more common 16:9. The 30-inch screen is just about the right size and if it were a little bigger, it would be too enormous for my taste. Moreover, the 2560×1600 resolution at that size allows for a crisp image quality with expressive details which are embellished by 1.07 billion colors. At 370 nits maximum brightness, the picture is as bright as it is vibrant. Besides providing highly accurate colors, the IPS panel also ensures the impeccable 178-degree viewing angles for the flawless viewing experience no matter the angle you’re looking at the screen. The PremierColor technology makes for the factory calibration which covers 100% of the sRGB, 99% of the Adobe RGB, and 117% of the CIE 1976 color spaces. Additionally, the CustomColor Mode allows you to manually adjust the color values to your own liking. When it comes to gaming, the image quality offers an immersive and high-quality gaming experience. However, for professional players, it is not sufficiently responsive due to the medium input lag and 17ms response time. The response time can be reduced to 7ms which although may cause some ghosting in fast-paced video games, is still exceptionally good considering that the Dell U3011 is not a gaming monitor. More importantly, the response time is fast enough to eliminate ghosting in the everyday use and editing. 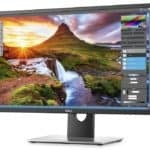 Besides the elementary color calibration features and the ability to swap between the sRGB and Adobe RGB color formats, the Dell U3011 offers many adjustable settings in the user-friendly OSD menu. The OSD menu is navigated with the capacitive-touch buttons which are placed at the right bezel and have no corresponding icons displayed on the frame but rather on the screen once you open the menu. The navigation through the menu is effortless as the buttons are surprisingly responsive. Once you open up the menu, the buttons will start glowing in a blue light as you hover over them, which is a nice touch (no pun intended). While not in the menu, these buttons can be used as shortcuts for swapping between the presets, quick adjusting option of the contrast and brightness, and toggling between the input sources. However, under the Personalize section of the OSD menu, you can assign these shortcut buttons to any other three functions instead. The OSD menu offers you the ability to choose between several different aspect ratios (16:9, 4:3, 1:1, aspect-correct), adjust sharpness, color, audio, and display settings as well as the Picture By Picture mode. 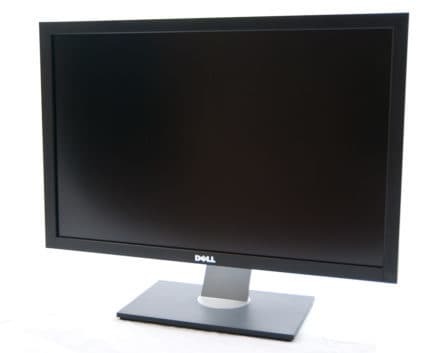 The Dell U3011 features the classic Dell design with a heavy and durable black base and a black plastic bezel. A silver plastic line goes around the frame and adds elegance to this modern and professional looking monitor. The screen of the monitor is coated with a matte, anti-glare protection which eliminates the annoying sunlight reflection. It is VESA mount compatible with 100 x 100mm pattern, so you can easily install it on the wall or a mounting arm. As far as ergonomics are concerned, it offers 120mm height adjustment, tilt by -5, +30 degrees, and +/- 30 degrees swivel. It cannot be pivoted, however, the base is detachable so you can pivot it the hard way if needed. The Dell U3011 offers extensive connectivity options that will suit all users. The ports include a DisplayPort, two HDMI 1.3, two DVI-D (with HDCP), and one VGA port. Additionally, there are three 3.5mm audio jacks for the 5.1 surround speakers, four downstream and one upstream USB 2.0 ports, and a 7-in-1 media reader card which includes SD, xD, MS, and MMC formats. 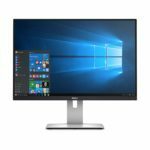 At the moment (March 2017), the Dell U3011 is available for around $900 which is a reasonable price for a high-end professional monitor. 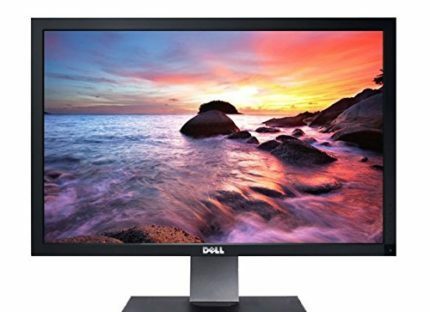 This monitor is also available as a 1440p 27-inch version, the Dell U2711. 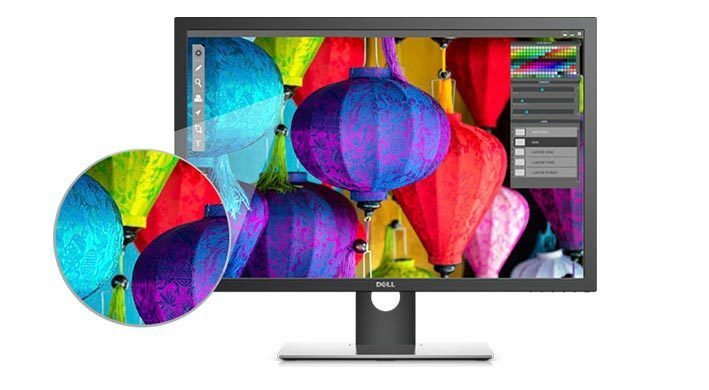 Also, there is a new version of this monitor available with DCI-P3 color space coverage, the Dell U3017. You can check out our review about it as well. The Dell U3011 may be expensive but it is not overpriced. This high-end professional monitor offers stunning image accuracy and vibrancy, a crisp picture quality, and an extensive connectivity. Moreover, it features an attractive and versatile design. Professional designers can view their content in both sRGB and Adobe RGB color spaces effortlessly and get their work done with certainty. When it comes to designing, the Dell U3011 lacks nothing. The Dell U3011 is an excellent monitor for the professional designers and photographers. It offers a crisp resolution, extra vertical space, vibrant and precise colors, and covers both sRGB and Adobe RGB color spaces.